So last night I posted a Miki Howard video just because that’s what I was listening to, but overnight it grew into a full-fledged blog post. Saturday, I saw this and it struck something inside me. Of course, it wasn’t new to me. But reading it at that moment just sparked something that I guess finally came to a head when I listened to Miki crooning last night. I’m definitely not a relationship expert, but I have learned some things over my few lil years in this world. Love, of all types, is one of those topics that covers so much that it’s hard to talk about. I mean, really… what is love? My fave thing to say about love, though, is that it’s not just a noun–it’s a verb. To have love for people is to show love for people. If it’s love for the community, you need to be doing something for the community. If it’s love for your family, you need to be contributing something to their health and well-being. (And currently, I’m thinking of my mother and her love for my grandfather, which is a whole other post about the highs and lows of caring for the elderly.) If it’s a romantic love, it’s not enough to be woo-woo’ing in someone’s ear about how much you heart them–those are sweet little nothings until some actions are aligned. One thing I’ve had to learn is that I have to be choosy (had to do that one for Aaliyah, R.I.P.) about who I dedicate my energy, my time, my patience, my love to. All that is so simply yet eloquently written in 1 Corinthians goes both ways. My love needs to be all those things, but I also have to remember that I deserve all those things. And if I’m not receiving that, I should love myself more and walk away. I mean really, we spend so much of our lives pouring ourselves into other people, not always taking the time to really evaluate if we’re giving out the right type of love to right people. And then we wonder why we’re so drained and bitter. What we’re pouring out, we should be getting back some kinda way. Love isn’t a finite thing with a usage limit. There’s plenty to go around and it multiplies when it’s shared. You don’t have to be a martyr for love. Give some, and make sure you’re getting some. So when someone comes around, whether a new friend or a new romantic interest, and is really positive and invested and caring, you have to be appreciative to the One above for placing that source of energy into your life. You can be thankful for the chance to give some of that patient, unselfish, hopeful love AND for the chance to recognize and receive it. So, sang it, Miki. 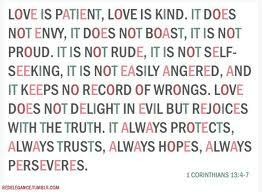 1 Corinthians 13:4-7AaliyahChoosey LoverloveMiki HowardmusicpositivityVivian GreenWhat Is Love? Love is haveing a wonderful date and not wanting it to end.. and afraid of kissing that special person because you dont want to mess things up by moving to fast…….